Jeppesen has signed a five-year digital navigation and flight planning service renewal agreement with China Cargo Airlines, the largest cargo air carrier of China. As part of a comprehensive information solution suite provided for China Cargo Airlines, components of the service agreement include JetPlan flight planning, digital charting, electronic flight bag (EFB), data distribution management (DDM), weather and NOTAM services. China Cargo Airlines additionally implements Jeppesen OpsData aircraft performance analysis and international trip planning solutions to efficiently manage airline operations. The service agreement with China Cargo Airlines solidifies Jeppesen’s position as the sole provider of JetPlan flight planning and digital charting services for all international cargo operators in China. China Cargo Airlines continues its transition to digital navigation information solutions through the agreement, which includes fleet-wide integration of installed EFB Class 3 services. The Jeppesen OpsData solution included in the agreement provides analysis of takeoff and landing performance and tailored airport departure procedures. This analysis allows the airline to maximize aircraft payload and comply with regulatory requirements. Additionally, digital weather and NOTAM information provides China Cargo Airlines with timely flight-critical data. China Cargo Airlines is a subsidiary of China Eastern Airlines, a leading global commercial air carrier. 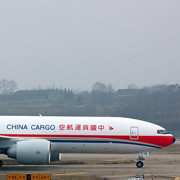 China Cargo Airlines operates 11 freighters through their cargo fleet. Shanghai Airlines Cargo International and Great Wall Cargo Airlines will be merged with China Cargo Airlines, which will expand the fleet size to more than 20 aircraft. China Eastern Airlines has more than 250 aircraft in its fleet and flies to 109 destinations all over the world. For more information on the industry-leading commercial aviation solutions provided by Jeppesen, please visit our commercial aviation navigation information solutions site.